This post was originally written by Paul Benvin way back in August of 2009. With the playoffs under way – we often think about some of the history, some of the superstitions and some of the lucky charms in hockey. 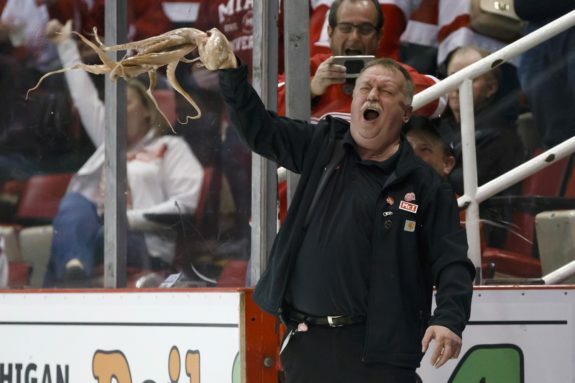 One such item, particular to the NHL, is the throwing of an octopus onto the ice in Detroit. A strange sports custom if ever there was one. Here now is that original post on the lucky detroit octopus. Al Sobotka, an affable man if ever there was one, is the building operations manager for Olympia Entertainment and the guy that has the enviable task — in hockey circles anyway — of resurfacing the Joe Louis Arena ice. Remember that song I Wanna Drive the Zamboni? Well Sobotka is living the dream my friends. He’s been taking laps around the ice surface on that Zamboni of his for nearly 30 years, and is such a staple in Hockeytown that folks arrive early before games just to take pictures of him. Hell, even the giant octopus that drops from the rafters before each and every Detroit home game is named after the guy. Now that’s respect; I have a hard time getting a large enough space on the bed, and I bought the thing. You might not know his name, but chances are you’ve seen his face, because Al Sobotka is also the guy responsible for scooping dead octopi from the ice. As a matter of fact the practice has even earned Sobotka a place in Colin Campbell’s heart: In April of 2008 Campbell sent a memo to the Red Wings organization banning octopi-twirling because, as the memo stated, “matter flies off the octopus and gets on the ice.” So there. For the true origins of throwing octopus onto the ice we must hearken back to the age of poodle skirts and The King of Rock and Roll himself, Elvis Presley. Back in 1952 the NHL boasted a total of six teams, and because of the league’s diminutive stature it only took a total of eight wins (two best-of-seven series) to clinch the Stanley Cup. That’s a far cry from today’s NHL, where 16 wins secures a date with Lord Stanley, but I’m sure you can imagine what those guys would have looked like — what with the primitive protection and all — if today’s grueling playoff schedule was in place back then. It would have been a massacre, and instead of being awarded a trophy teams would instead be treated to free room and board at Detroit Receiving Hospital. It give me chills just thinking about it. But I’m getting off the subject. It took eight games to win the Cup, so when Detroit swept the Toronto Maple Leafs and the Montreal Canadiens en route to their 1952 championship two Detroit area store owners — Pete and Jerry Cusimano they were — threw the eight-tentacled beast onto the ice and the Legend of Detroit’s Lucky Octopus was born. Ever since then people have been lobbing the sea-born suckers onto ice surfaces all over the country. In 1995 fans of the Wings threw 36 octopi onto the ice, including a ridiculously rotund 38-pounder that was heaved — in tandem I presume — by Bob Dubisky and Larry Shotwell. The two men weren’t done though, because the following year they topped their previous octo-put by 12 pounds, when the two covered the ice in 50 pounds of slimy octo-guts. And Al Sobotka? You remember Al, right? Well he then proudly displayed the mutilated mollusk on the hood of his Zamboni between periods. Talk about dedication to the job. 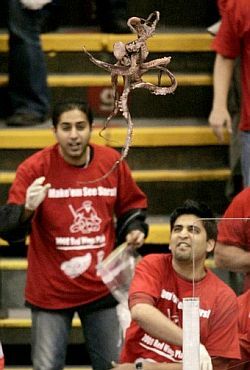 Of course other fans around the league have put their own spin on the octopus toss, but none ever caught on like the one born right here in Michigan. In the ’95 series between Boston and New Jersey a fan of the Bruins threw a lobster onto the ice, and in ’96 fans of the Florida Panthers took to throwing thousands of toy rats whenever the Panthers scored. Unfortunately for Panthers fans that practice was short-lived due to both the lengthy cleanup time involved as well as the Panthers eventual implosion in the Stanley Cup Finals that year. There was also supposedly a guy who smuggled a 4-foot leopard shark into the HP Pavilion during the Detroit/San Jose series in 2007, but one has to question whether or not that was an inside job. Security can’t be that lax, right? Then again anything’s possible. I mean Tampa Bay did win a Stanley Cup.